What if Galaxies are Artificial Constructs? I was recently reading about the Kardashev Scale. It’s a method of measuring a civilizations level of technological advancement. “A Type I civilization uses all available resources impinging on its home planet, Type II harnesses all the energy of its star (See Dyson Sphere), and Type III of its galaxy.” So let’s assume there have been Type III civilizations that have existed at some point within the billions of years the universe has been around. 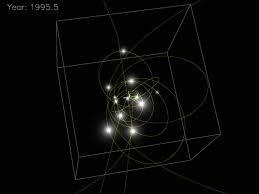 These civilizations would have the ability to move stars and interstellar matter on a scale we can barely comprehend. On a recent episode of Through the Wormhole, physicist Michio Kaku, postulated that a wormhole could be created by arranging stars in to a tight orbit around each other. A wormhole could be a gateway in to another universe, a way for a species to escape our universe. Because ultimately our universe will come to an end. This eventuality represents a challenge to a long-lived, advanced species. In much the same way, our species faces the relatively short term challenge of relocating our entire population from this planet. Our sun will destroy the earth in a few billion years, if not sooner. Astronomers have found evidence of stars orbiting blackholes in the center of galaxies. See diagram below. 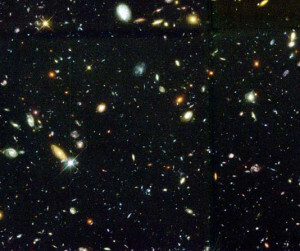 What if the billions of galaxies we see represent the constructs of billions of species who have reached Type III status? Could galaxies be constructed wormhole factories? 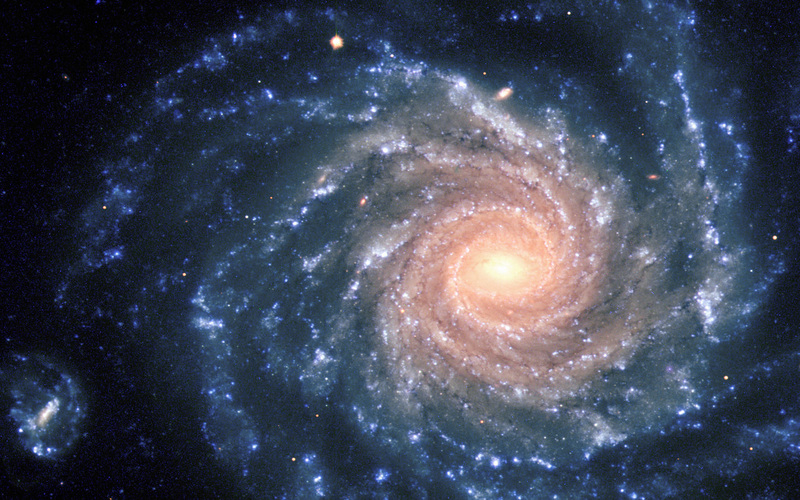 Galaxies could be wormhole factories in the making, escape routes for advanced species. 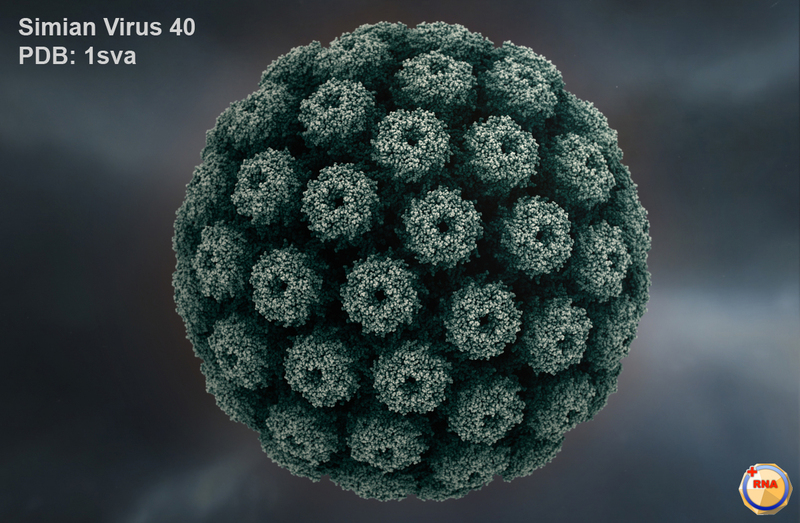 Our species, so far, could be the equivalent of microscopic mold growing on a damp floor, in a small room within a massive car factory; An incidental development in the grand scheme of things. This entry was posted in Astronomy, Cosmology, Evolution, ExtraTerrestrial Life, Science, Through the Wormhole on August 1, 2013 by HFuturist. One of the more interesting concepts being discussed lately and making it’s way closer to main stream is Retro Causality. For the purposes here, it means the future can effect the past. 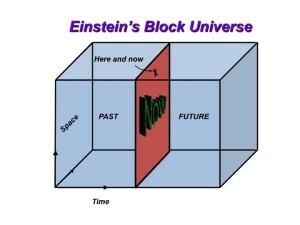 Some interpretations of Einsteins theory of relativity lead to the idea of the “Block Universe”. A universe where the past, the present and the future exist simultaneously. We simply live in the illusion that there is a direction to time…forward. See the diagrams below. 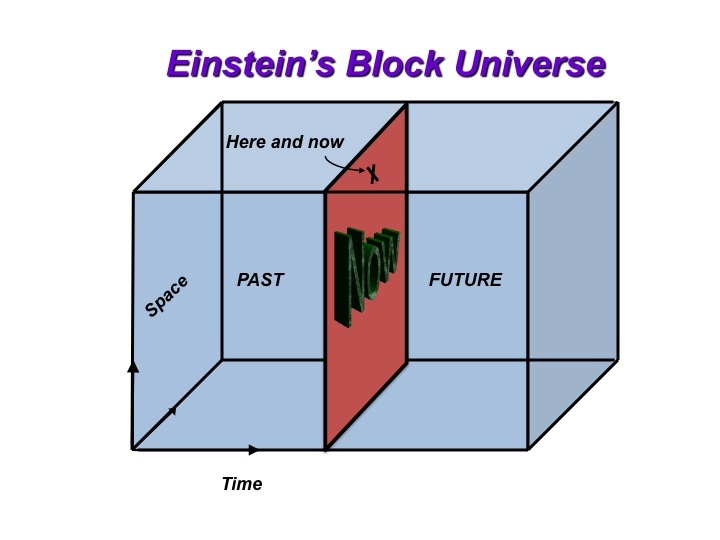 Rather than flowing forward, different points in time are represented as different dimensions within the block. Like one amorphous loaf of bread, something that happens to one crumb within (say the growth of mold) effects the crumbs next to it, no matter the direction. Some say the Global Consciousness Project at Princeton University may have evidence to support this theory. Apparently, information about the tragic 911 attacks was accessed by our collective unconscious before it occurred. 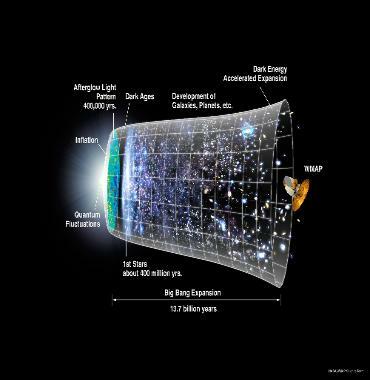 This entry was posted in Astronomy, Time on August 1, 2013 by HFuturist.